Bass Rock is now the world’s largest colony of Northern Gannets, and along with neighbour Craigleith, is also home also to cormorants, kittiwakes, shags, guillemots, razorbills and, of course, PUFFINS (I saw puffins!). Like everyone else, I adore puffins. The head of a curious seal was also visible, just one, another bright shape watching us from Craigleith’s shadows where stone meets water. Craigleith with the great white mass of Bass Rock beyond it. 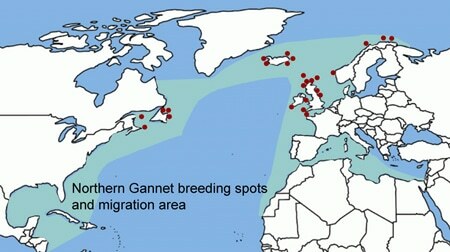 Northern gannets are beautiful things, spending time here between March and about October. They mate for life, and return year after year to the same patch of rock to mate and raise their young. They are intensely territorial while here, but after leaving Bass rock they will head to Africa. Seeing a natural wonder of the world and birds who migrate from Africa to the UK and back again right above all stupid human borders doesn’t make the world any easier to bear right now, but, you know, it shows there are other ways to do things. Spending time with my little brother was also pretty awesome. More views of gannet-strewn rocks and crevices — I somehow didn’t get any of the guillemots, who I also love. Tantallon castle’s ruins lie quite spectacular in the distance, but nothing compared to this. up to the lighthouse, and the castle-become-prison for Covenanters and Jacobites with an old hermitage somewhere there as well. The lighthouse on Bass Rock was built by the Stevenson family who were lighthouse engineers — the family, in fact, of Robert Louis Stevenson, who also trained as a lighthouse engineer. It features in his novel Catriona, and an island just down the coast from here (visible from the boat in fact) is supposedly the inspiration for Treasure Island. A last view of this wondrous place from North Berwick — itself a beautiful little town. I saw puffins! Tristram and I had quite a lovely day, which also included Dirleton Castle, but I’ll write about that later I think. Sunday we had a traditional Scottish barbecue with Laura’s family — in the pouring rain with our brollies and sandals, and for a little while there I also though Ireland might progress to the final eight, but sadly that first goal was not repeated. Good games today though, and good to see family I’ve not seen in ages. We even watched an hour on the Royal Highland Show — a procession of bulls, cows, sheep and coats moved across my screen in a strange recap of the past two months that has transformed how I watch such things.